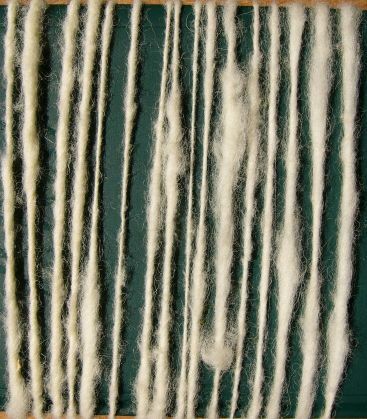 This was my very first yarn, spun in 20 minutes under the direction of a lady demonstrating spinning at a harvest festival featuring old crafts. The wool was machine-carded, and the "instrument of torture" a much too heavy beginner's spindle (I believe an old Ashford model, but I may be wrong). The resulting yarn is nothing to be proud of, but it was a start! This is my second yarn. If it looks worse than the first, that's probably because I was working with a handful of raw wool that I had picked up on a farm. Besides, I now had a home-made spindle which probably didn't spin all that well. I can't verify any more because I gave it to a lady who breeds Angora goats and thought about learning to spin, too. Said lady gave me the mohair for my next spinning attempts. 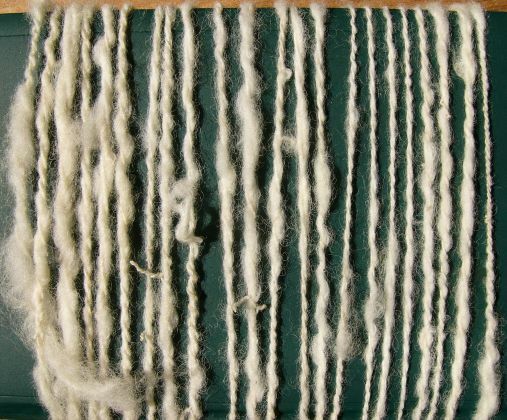 Now, mohair is not the perfect yarn to practice on for a beginner because it's so slippery. But I didn't know that. Besides, I didn't have any cards, so I couldn't really smooth out the fibre. 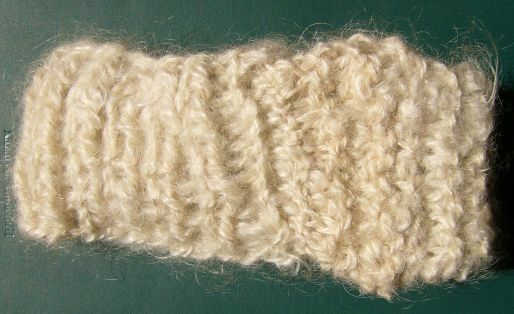 And unwashed mohair can be rather sticky, as well! 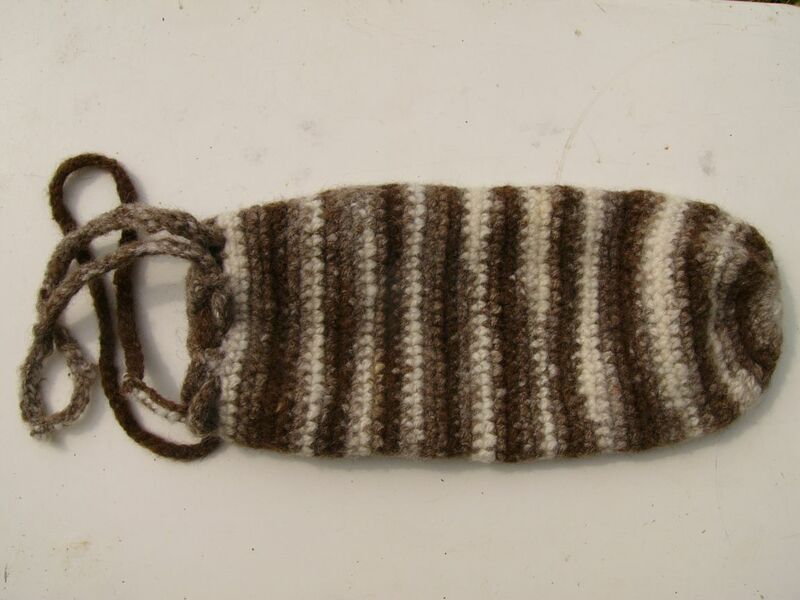 So, between only perfunctorily washing the fibre and teasing it open with my fingers I succeeded in making a yarn that I deemed worthy to be knitted up into a wrist distaff. What's the point of this page? I want to show you that the very first beginnings are difficult and that the first yarns do not come out even. That's normal. Do you remember your first attempts at writing? When you laboriously put a pen to paper and tried to copy your letters - wasn't it hard work? But nowadays you write your shopping list without thinking about the act of writing. Handspinning is the same. It's a new skill to acquire, and that's really all there is to it. You don't need any special physical or mental abilities. Just give yourself time. Time to practice, and time between practice to let the movements settle into your muscle memory. And remember: Knitting (or crocheting) smoothes out a lot of unevenness, and if the yarn is really horrible, you might try to felt the finished object. The crocheted bag here in the gallery came about that way: After watching Mable Ross's video I wanted to learn spinning long-draw. My first attempts at that were about as "nice" as my very first yarn. But the finished bag (felted with a load of laundry in the washing machine) looks alright!